I've never been the biggest fan of oatmeal. Despite knowing the health benefits it can have, I've always found the taste either bland and kind of a boring way to start the day. A few months ago, Modern Oats sent me some of their oatmeal to try and I now wonder if everything I knew about oatmeal was a lie! Modern Oats was founded in 2013 with the goal to "Change people’s perception of “old fashioned” oatmeal." Besides their focus on taste, Modern Oats oatmeal is gluten-free and contains Non-GMO Verified oats and artisan selected fruits, nuts, and seeds. To sample, I was sent Chocolate Cherry, Mango Blackberry, Apple Walnut, 5 Berry, Nuts & Seeds and Goji Berry. I was not expecting the fruit in the oatmeal to taste as good as it did. My experience has been that the fruit bits in oatmeal tend to be really small and taste like they have been preserved. The fruit really stood out to me and added enough sweetness to the oatmeal. The Nuts and Seeds flavor did not come with fruit, but I added some fresh strawberries and it totally made my morning. I enjoyed all of my Modern Oats samples at work. 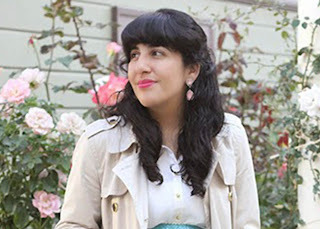 I feel like I am always in a rush in the morning and prefer to sleep an extra 10 - 15 minutes instead of making myself breakfast. I loved that these were conveniently packaged to be a portable (and recyclable) bowl. I kept a few at my desk and used the hot water dispenser in the kitchen to fill the cups before enjoying. My favorites among these samples were Goji Blueberry and 5 Berry. Each container has a recipe to create 2 oatmeal cookies. While I didn't have a chance to bake any since I really enjoyed eating these for breakfast, I would like to try making cookies out of the Apple Walnut and Chocolate Cherry flavors. Since these were really easy to prepare and tasted really good, I would not hesitate to purchase these to keep in my cubicle and as part of a future camping or hiking trip. 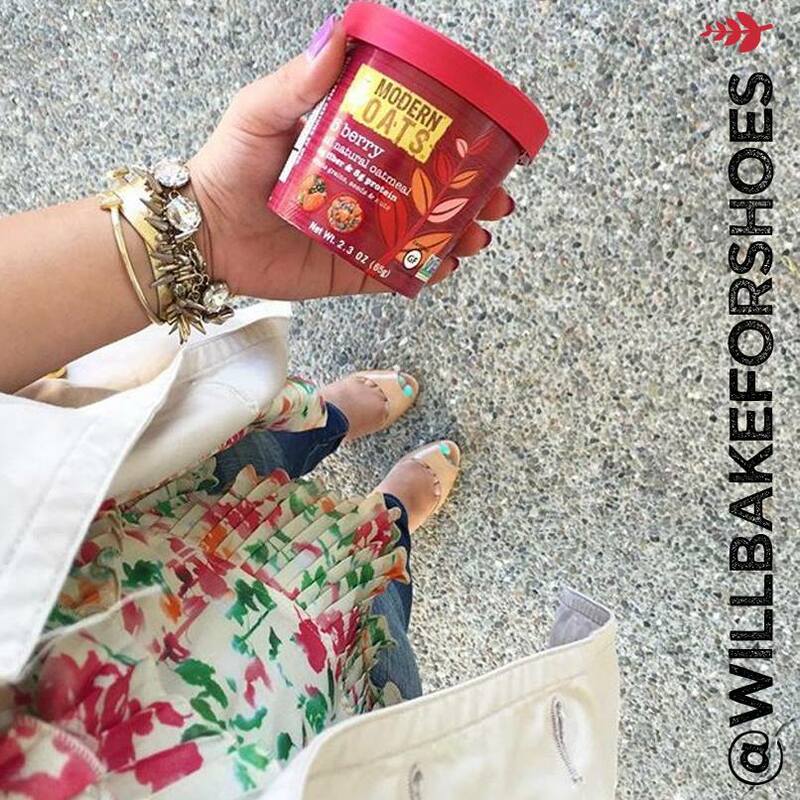 Modern Oats proved itself to be the perfect, healthy, anytime, anywhere snack. Their new flavors sound intriguing, Coconut Almond and Vermont Maple, and both sound like they would make delicious oatmeal cookies. 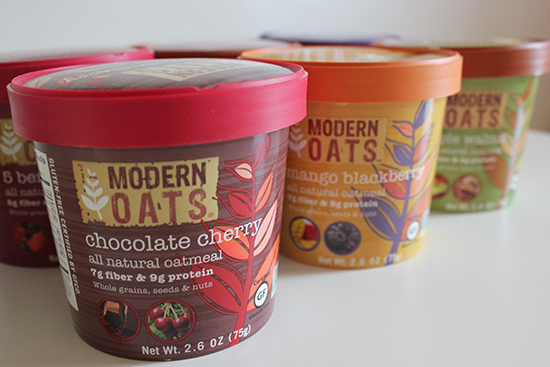 To try Modern Oats, you can search for them using their store locator or order from Amazon. 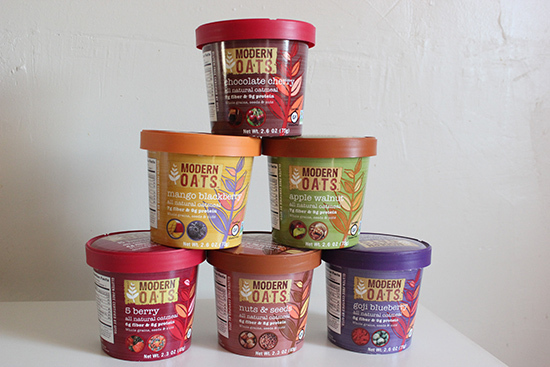 let me know if you have tried Modern Oats and what your favorite flavor is! 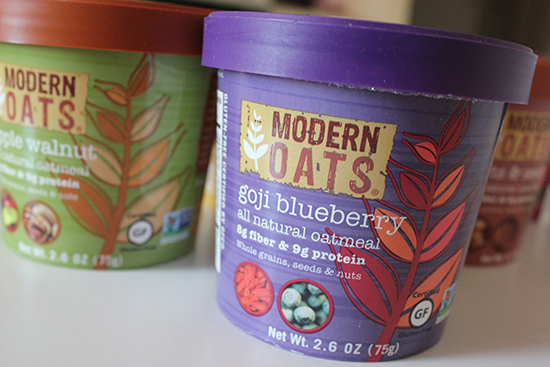 I received samples for review from Modern Oats. All opinions expressed are my own.